Not too long ago I was asked to look at an office space for Langmead Farms. As a producer of herbs for the likes of Tesco and Waitrose it was was vital to create an impressive space and atmosphere with a crisp, fresh look. This was achieved by some excellent decisions from members of their office in terms of furniture and carpets etc. I supported this using simple and modern designs which provided answers to their practical needs. 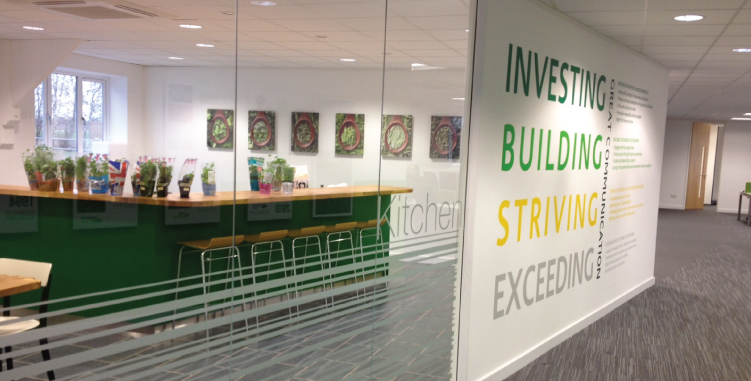 The kitchen looks fantastic with the images of the spoons supporting the theme, colours and environment beautifully. The detailed timeline explains the company history as you enter the office and the company values mirror it nicely. The collection of canvas images allows the staff to chop and change the imagery and is a cheap and effective way of freshening things up without changing all of their images. So far the feedback has been excellent with compliments coming from all of their visitors. Maybe Tesco will give me a call…then again, maybe not. If you are Tesco or anyone else who’d like to discuss your office space, contact us! P.S. I did use a map for a wall graphic that I’d downloaded from the internet and it was flawed. Word of warning – get a map from a reliable source – it’s hard work trying to change the world!